PVRIS' Lynn Gunn and All Time Low's Alex Gaskarth also voiced their support on social media. 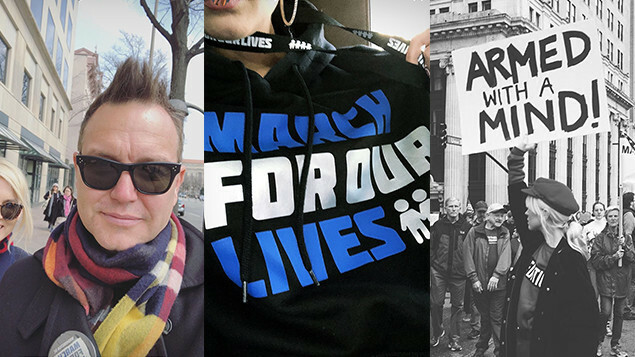 Musicians including Mark Hoppus, Billie Joe Arnstrong, Alex Gaskarth, Hayley Williams, Halsey and Jared Leto voiced their support for the 'March For Our Lives' which took place across the US this past weekend (March 24th). The event was organised in response to the shooting at Stoneman Douglas High School in Parkland, Florida which left 17 people dead in February. Thousands attended marches across the country with the central event in Washington DC being led by several survivors from the shooting who gave speeches at the rally. You can get details on March For Our Lives, including how to donate, by clicking here. Candid photo of my family, me, and a few hundred thousand of our closest friends at the March For Our Lives event today. Fall Out Boy performed at a benefit concert the night before the march, with Pete Wentz giving a powerful speech in support of the movement prior to introducing 'The Kids Aren't Alright'.